Paul offers a FREE first / introductory lesson! I am an experienced teacher with some 40 years experience. 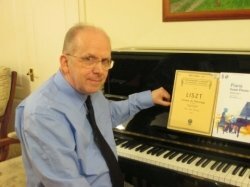 I hold the Diploma of the Associated Board (Piano Teaching). I am a Fellow of the Incorporated Society of Musicians and a member of European Piano Teachers Association. I have taught Piano in Warwickshire and Aberdeenshire to pupils whose ages ranged from 4 years old to retired people in their 60's. Many of my pupils have achieved distinction in their Associated Board exams (there were 57 distinction exam passes from 1994 - 2010) and many won their classes in local music festivals. One pupil achieved the highest mark in the UK for her Grade 7 piano examination and then gained the highest Grade 8 mark in Grampian, achieving entry to the performers course at Royal Scottish Academy in Glasgow and is now studying at Royal College of Music in London. Three other pupils have passed their Grade 8 exams with distinction. I believe that every pupil is an individual with different needs and should be allowed to progress at his or her own speed. I use the latest teaching music carefully selected for the needs of the pupil. I have a special interest in teaching children with learning difficulties e.g. dyslexia. Todays children love using computers, iPods, mobile phones and game boys. I use modern technology wherever possible: CD and computerised recordings/accompaniments/games are used to aid learning. Recordings are put onto MP3 players and iPods. All styles are taught from Baroque and Classical through Romantic to Modern music including Jazz, Rags and Blues!